Support activities which demonstrate community-based, innovative, gendersensitive and sustainable approaches. CEE has been working in the field of EE and ESD for the past twenty years. To ensure that this rich experience benefits other non-government and community organizations and initiatives, CEE has undertaken a number of programmes. These focus on information sharing, capacity building, monitoring, etc. to enhance the effectiveness of programmes and projects. In 997, CEE launched a three-year programme for training and information support to NGOs and local communities to participate in conserving India 's biodiversity. This was a collaborative project with Field Studies Council (FSC), UK , and supported by the Department of Environment, Govt. of UK, under the Darwin Initiative. A comprehensive training package, seeking to bring locale-specificity to Darwin projects, was developed and field-tested. NGOs were trained according to their needs, helped to develop projects, and financially and technically supported to implement them. Following this pilot, the initiative was extended to 60 projects, covering a range of subjects – from training and education to conservation action – in different parts of the country in partnership with local NGOs. CEE's regional cells translated and adapted the material developed to local contexts. The Small Grants Programme (SGP), funded by the Global Environment Facility (GEF), seeks to support activities which demonstrate community-based innovative, gender-sensitive approaches and lessons learned from other development projects that could reduce threats to local and global environment. 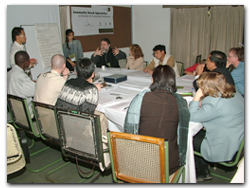 UNDP and MoEF jointly administer SGP in India , and CEE is the National Host Institution (NHI) since 2000. The programme has so far facilitated 162 action-based, community-led initiatives countrywide. Grants are channelled directly through CBOs and NGOs to address the issues of environment, poverty reduction, sustainable livelihoods, and community empowerment.